1 Introduction TFT is widely used in industrial automation, power, telecommunications, environmental protection, medical, financial and other fields because of its thinness, low radiation and digital. Compared with the black and white module, the TFT liquid crystal display module has its complicated features. 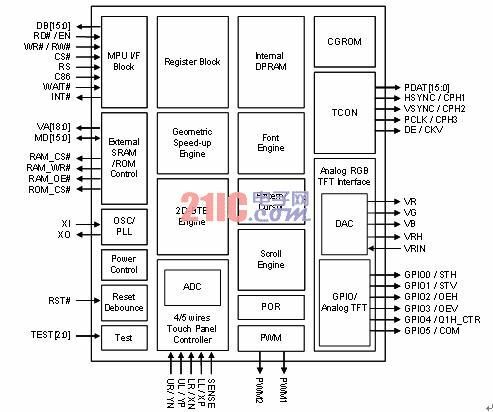 It has various display interfaces, complicated peripheral circuits, and no mature unified control chip. Therefore, for the customer, choose the LCD screen, drive control scheme, accessories, And application debugging requires quite a professional staff to carry out. Therefore, for many MCU users who want to use TFT, this is a very high threshold. One is worried about the upgrade of the MCU system, the second is not enough speed, the effect is not good, the third is afraid of the cost is too high, and the fourth is afraid of programming trouble. TCON and DAC inside the RA8870 must be used when using the analog TFT screen. The output voltage level and driving capability of VR, VG, and VB can be fine-tuned to adjust the matching with the analog screen. 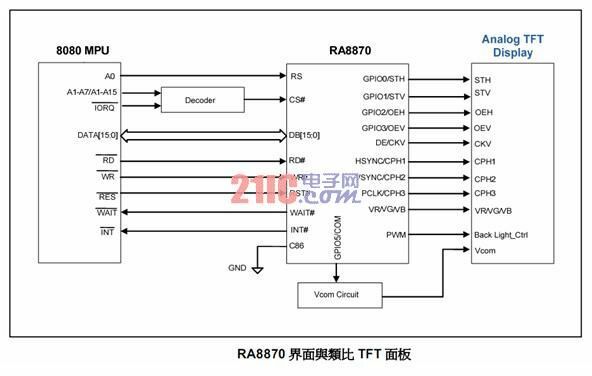 The application circuit of the RA8870 connected to the analog TFT screen can be seen that some signals are shared with the GPIO or digital TFT interface, while the RGB signals (VR, VG, VB) are generated by the RA8870 internal DAC. In many industrial control situations, various electrical interference sources are relatively strong. 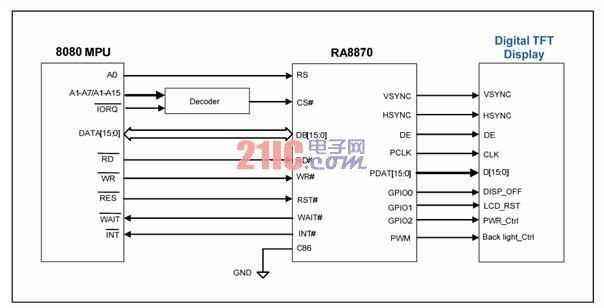 To mitigate the effects of these interference sources on the transmission between the MCU and the RA8870, it is recommended to add a small capacitor to the GND at the CS#, RD#, and WR# terminals of the RA8870. 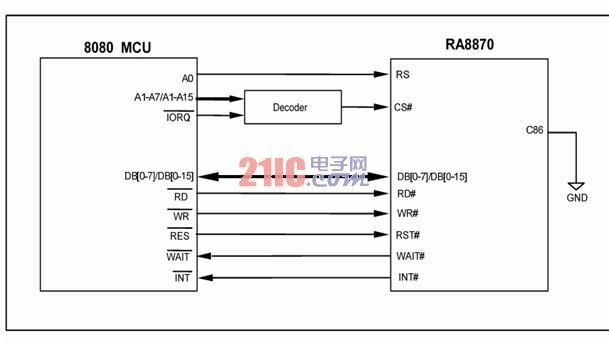 6 Conclusion The RA8870 provides a low-cost 8-bit or 16-bit 8080 / 6800 MCU interface, as well as a 10-bit 4-wire or 5-wire touch screen controller. Two additional sets of Pulse Width Modulation (PWM) can be used to adjust the TFT. Screen backlight or other applications. Compared with other solutions, RA8870 is a powerful and inexpensive color TFT controller, which can make the application of monochrome STN screen smoothly, quickly and easily converted into TFT screen application, and solve the designer's hardware and software development. Do not hesitate to achieve a low-cost, high-performance system solution. FBELE has been devoting our efforts into technology production and developing new products in Box Loudspeaker. Now, our products contain two chief-lines which are elecronics and technologies. In these areas, our company is the premier manufacturer integrating product development, producing and sales. And we also provide OEM or ODM service to meet all kinds of customers` requirements. The producing processes are strictly controlled, and all members on the product line are professionally trained. The average producing capability reaches 9,000,000 per month, and we can supply technology support to our customers. In order to realize superior business operations, we regard "Service, Quality, and Innovation" as our business principle, and do our utmost to reach it. We strongly believe that our company shall achieve another outstanding success with all our staff's efforts and contributions. welcome customer from all over the world contact us to purchase.